Parallax designs has become very popular now a days and is being adopted because 3D effects are possible with it. If you want to create your site with parallax design and 3D effects then AccessPress Parallax WordPress Theme is better solution for that. It is a beautiful free theme on WordPress. You can attract your visitors using parallax designs which will give stunning look to your site. AccessPress Parallax theme will make sure your visitors will come again and again. This theme is built such that it is useful for anyone and everyone who wants to build Travel, corporate, small biz, portfolio, agencies, photography, health, creative websites. It is full of features like : fully responsive, advanced theme options panel, featured slider, advanced post settings, services/team/blog/portfolio/testimonial layout, Google map integration, custom logo/favicon, call to action, CSS animation, SEO friendly, translation ready, RTL support, custom CSS/JS and more. It has clean coding and easy customization ways. It is a multipurpose theme. You can create almost anything you want to. AccessPress Parallax theme has wonderful parallax designs. You can create portfolio section showcasing your products/applications. Its call to action is especially designed for marketing or sales message which tries to convince a person to perform a desired action immediately. You can add testimonials in testimonial section. One Page parallax scrolling WordPress theme was a revolutionary change in WordPress themes. Everyone found one page themes more user friendly and easy to navigate through. The design of one page themes has become very popular and is being adopted because 3D effects and different transition effects are possible with it. One page parallax scrolling themes make your website engaging, interactive, effective and full of amazing surprises. These themes are great in inviting visitors via Call to Action and increase your conversion rates. There are plenty of Parallax scrolling themes in WordPress but the one with all these features is rare. I found an awesome theme on wordpress.org website called AccessPress Parallax WordPress theme by Access Keys. 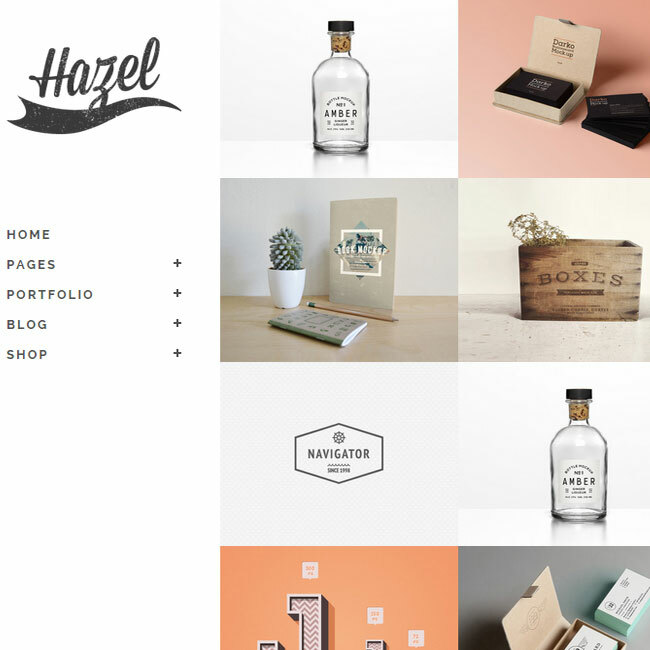 I used this theme for my business website and found it really useful and full of surprises. I am glad to share my experience with this theme. For a corporate or any business website it is great to have a slideshow on front page then services, features and testimonials appearing on front page and some may wish to show portfolio, blog posts, etc on front page that will later direct them to detailed pages. These things are very well managed in this theme. It provides us with multiple options for each section we wish to create. For each section you get a menu item created on top which will scroll users to those specific sections. It is included with a fullwidth slider with multiple options. This theme is just best at its purpose. On activating this theme you get a list of recommended plugins for this theme which will help you build more promising website with it. These plugins are AccessPress Social Counter, AccessPress Social Icons, AccessPress Social Share and Ultimate Form Builder Lite. Further this theme has some customization options in Appearance => Customize and multiple Theme Options in Appearance => Theme Options that will help you customize this theme with every minute detail directly from dashboard without coding. Live Customizer has options to add site title, tagline, select colors of header text and background You can upload header and background images from here. It has four widgetized areas in footer, you can put required widgets from here and from Appearance => Widgets also. General Settings: Enable/Disable Single Page Parallax Home Page, Single Page Navigation(Menu), Animation on scroll, responsiveness and upload logo, favicon and also select header layouts from here. Parallax Sections: From here you can add new sections to your homepage. Each section will have options to choose page of the section, font color, background color, layout options to choose from Default, Service, Team, Portfolio, Testimonial, Blog, Call To Action, Google Map, Blank section. Also you can upload different background image to each section and manage all background settings from here. Post Settings: Show/hide Posted on Date of post, Show Post Author, Post Footer text, Prev Next Pagination. Slider Settings: On/Off slider, select category from which you want to feature posts, enable/disable Slider overlay – Black Dots, Pager, Controls, Auto Transition, Slider Transition, fullwidth layout, etc. Social Icons: It allows you to show/hide social icons. Several social links are accepted by this theme like facebook, twitter, googleplus, youtube, pinterest, linkedin, fickr, vimeo, instagram, skype. Tools: Add custom CSS from here. This theme is 100% fluid responsive to all devices ranging from desktops, laptops, tablets to mobile. The layout of this theme on each screen size will really impress visitors. A business/corporate website is usually very light but in some cases it may happen that there is lot of content in website. At such times also the theme should load fast. The PageSpeed score depends on the demo page content, caching of the page, number of HTTP requests, Image sizes and lot many other parameters. I checked the Google PageSpeed of AccessPress Parallax official demo on Mobile and Desktop mode. The Performance is not impressive on both the devices. It is recommended to use W3 Total Cache plugin, WP Super Cache plugin to overcome this issue. This theme is fully safe to use. It has passed both the tests. 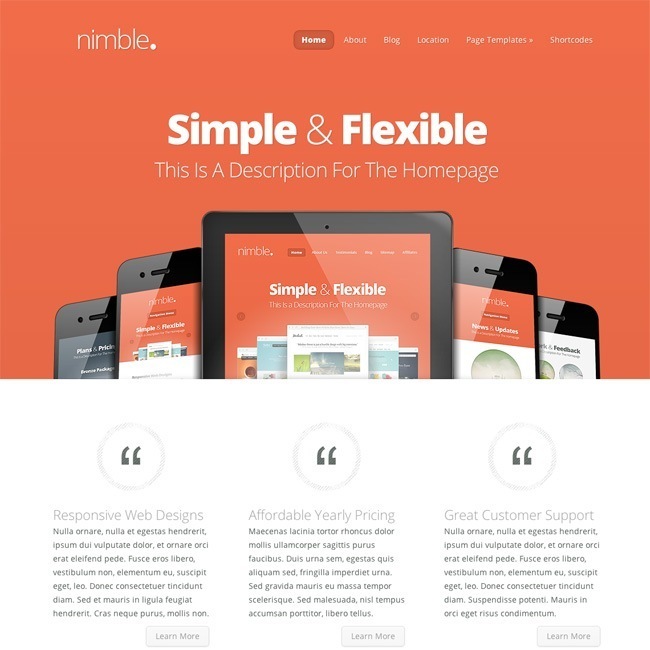 Conclusion: This theme is awesome for a minimal corporate or small business website. It is packed with almost all the features necessary in a professional One Page website. Parallax scrolling is smooth enough. Other page layouts are page with right sidebar and there is also a homepage template provided. So overall this theme is very rich in features despite of being free. Plugins recommended for building website are worth with this theme. All the important sections are covered. Very well documented for guiding newbies. All important social links are accepted. 4 widgetized areas for footer. 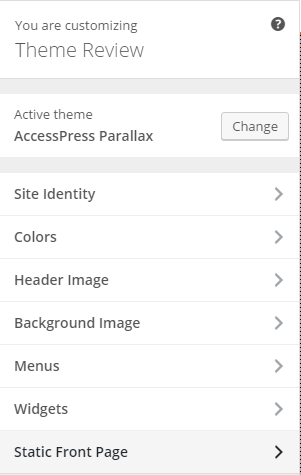 This theme is exactly like its name – Access Press Parallax. I loved the slider comes with this theme. I have never seen slider like this. This is a full width slider and very big that really looks very attractive on my website. My visitors love it and they like to visit my website again an again. WOW Awesome theme. I have never seen a theme like this. I was searching more that a week that comes with 3D effects. This theme provides parallax effect. It fulfilled all my requirements. It provides many things in one like theme options panel, featured slider, advanced post settings. Go with this theme because this theme has fully responsive layout and great full width front page slider that gives unique looks to my website. My website looks very attractive on all types of devices. The with hover effects for portfolio section is awesome that give good looks of my website. The lazy load helped my website loads fast.